Anxiety and panic are complicated phenomena for which no single cause has been identified. Various researchers have found physiological (body) and psychological (mind) contributors (see Causes of Panic Attacks). They have also found that people with panic disorder tend to breathe shallowly and are prone to hyperventilating, which causes dizziness and other problems associated with panic. Yoga corrects breathing problems and increases overall consciousness of the breath throughout the day, which in turn reduces tension in the nervous system. However, its benefits for anxiety sufferers may be even more far-reaching. Yoga incorporates elements of other therapies, such as slow, deep breathing and meditation, which makes it an excellent complementary therapy for those who suffer from panic disorder or generalized anxiety disorder. Dr. Rolf Sovik (2004), a licensed clinical psychologist and yoga instructor, notes that yoga can provide the following benefits for anxiety sufferers. Yoga, addresses the physical, psychological, and spiritual contributors to anxiety. When practiced regularly, it improves breathing, increases psychological and physical balance, and provides greater control over thoughts (which is particularly important, as unrealistic and catastrophic thinking can trigger and worsen panic attacks). For those who use yoga as a spiritual practice as well as a healing activity, it may yield even greater benefits. Clearing the mind during yoga practice may also create space for insights into your anxiety, such as aspects of your life that are contributing to it and things that you could do to reduce it. According to a Harvard Mental Health Letter (2009), some well-designed studies conducted in recent years indicate that various yoga practices can reduce exaggerated stress responses (affecting heart rate, blood pressure, pain threshold, etc. ), which means that they may be good complementary treatments for anxiety and depression. Studies suggest that yoga may also help with conditions that contribute to anxiety, such as migraine headaches and poor sleep quality. In addition, yoga has shown promise for treating PTSD in war veterans. An online search yields many anecdotal reports in which people attribute a reduction in anxiety or even the elimination of their panic attacks to regular yoga practice. Research cited by Streeter et al. (2010) indicates that people who suffer from anxiety disorders, mood disorders, and epilepsy tend to have lower-than-average levels of activity in the γ-Aminobutyric acid (GABA) systems of their brains, and yoga has been shown to increase GABA activity. The researchers speculate that the beneficial GABA effects may arise through yoga’s ability to increase activity in the parasympathetic nervous system, which has the opposite effect as the sympathetic nervous system (the system that becomes overactive during a panic attack). Although yoga may provide a number of significant benefits for anxiety sufferers, there is the potential for injury, particularly if you try to adopt extreme poses too quickly. To avoid problems, check with your doctor before beginning a yoga program. If you have certain medical conditions, you may need to avoid or modify a few of the poses. Always warm up before stretching and don’t be competitive with yourself or others, pushing poses further than you should. Ideally, you should find a good yoga instructor. If you’re learning yoga at home on your own with a DVD or book, go slowly and carefully at first. There are props you can purchase, such as blocks and cushions, that will enable you to work on challenging poses while reducing your risk of injury. Remember, you don’t need to be able to twist yourself into knots to gain anti-anxiety benefits from yoga; the benefits arise through good breathing techniques, mindfulness, gentle stretching, and calming of the parasympathetic nervous system, and you can get all this even from the gentlest poses. For more natural anxiety remedies and anxiety reduction techniques, visit the main Natural Anxiety and Panic Treatments page. Dryden-Edwards, R., MD (Author), Conrad Stoppler, M., MD (Editor). (2010, 25 March). “Panic Attacks.” EMedicineHealth.com. Harvard Medical School. (2009, April). 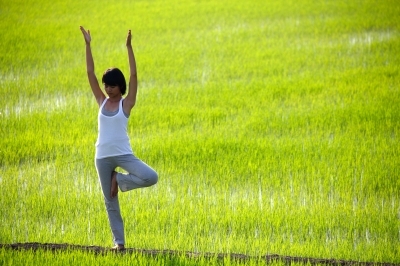 “Yoga for Anxiety and Depression.” Harvard Mental Health Letter, Health.Harvard.edu. Streeter, C.C. ; Whitfield, T.H. ; Owen, L.; Rein, T.; Karri, S.K. ; Yakhkind, A.; Perlmutter, R.; Prescot, A.; Renshaw, P.F. ; Ciraulo, D.A. ; & Jensen, J.E. (2010). “Effects of Yoga Versus Walking on Mood, Anxiety, and Brain GABA Levels: A Randomized Controlled MRS Study.” The Journal of Alternative and Complementary Medicine, 16(11), 1,145-1,152.